Tubular netting bead stitches are variations of tubular peyote, so it may be easier to learn Russian spiral if you are familiar with even count tubular peyote or odd count tubular peyote stitches. The rope created with Russian spiral can be thick but is still very flexible compared to other beaded rope stitches. To make a Russian spiral, you will need at least two different colors and sizes of beads. Once you are comfortable with the basic stitch, you will find that a wide variety of beads will work with the Russian spiral stitch including a variety of crystals, bugle beads, and assorted size and shape seed beads. For this example, we are using size 8 Miyuki beads and size 11 Czech seed beads, a size 11 Tulip brand beading needle, and 6 lb. Fireline beading thread. You can use Nymo, Wildfire or any other beading thread that you are comfortable working with. If you use Nylon thread, it may help to condition your thread. Russian spiral is worked in sets of three beads. Each set consists of two smaller beads followed by one larger bead. Begin by picking up three sets of three beads each, for a total of nine beads. If you are following my example, pick up two size 11 beads and one size 8 bead and repeat that two more times. Pull the beads into a ring by stitching through all of the beads a second time. To position your needle to start stitching, go through the first size 11 bead so your thread is exiting between two size 11 beads. The beads will pull nicely into a circle after you stitch through the first size 11 bead. Pick up a set of three beads, starting with the size 8 bead and then two size 11 beads. Skip over the next two beads in the ring (a size 11 and 8 bead) and stitch through the third (the size 11) bead. Pull your thread taut. 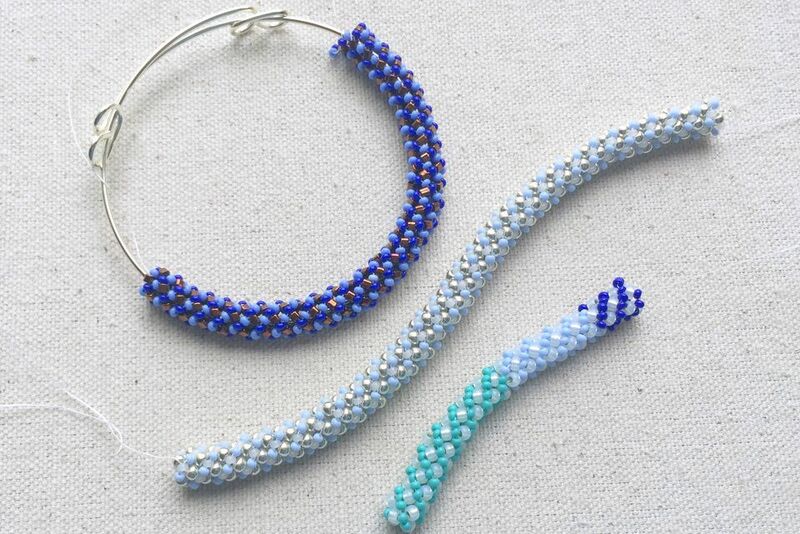 As with most spiral bead stitches, the first couple of rounds will tend to be floppy and go out in a circle as opposed to upward into a tube. Do your best to keep the beads stacked on top of each other and maintain tension. Each new stitch will consist of a set of the same three beads. To continue, pick up a size 8 bead and two size 11 beads. Skip the next two beads from the prior row in the ring and pass through the third bead. Pull the thread taut to maintain tension. We are going to repeat this process one more time to finish the row and then do a step up. Pick up another set of the same three beads. Skip the next two beads, and stitch up through the third bead in the first base round to complete the second row. Then go through the first two beads that you added in the second round. This process of passing up through three beads on the last stitch int he row is the step-up that positions your needle to begin the next round. You need to make this step-up to complete every third stitch. Pick up your next group of three beads. Skip the next two beads from the previous row, and stitch into the third bead. At this point, you should start shaping the beadwork into a tube. The first two rows will typically spread out, but once you start the third row, you can push the rows up and start having them form the tube. Note that it can be confusing to differentiate the beads on the previous row from the beads two rows before because they are close together. If you are working with the same bead sizes as me, you will notice that for each stitch you will be stitching through the first size 11 bead after the size 8 bead on the prior row. Continue stitching, one round at a time, always stepping-up through three beads to complete the last stitch on the row. Your Russian spiral beaded rope will begin to grow pretty quickly once you get the hang of the stitch. Whenever you need to start a new thread, begin by weaving it several rows before and securing it with a half hitch knot. Once you have added a couple of more rows with the new thread, you can switch the needle back to the old thread, tie one or more half hitch knots and weave the old thread into the beadwork you made with the new thread. This provides a smooth transition and the most secure ends. Changing the types and colors of beads has a big impact on the look of the Russian spiral stitch. On this tube, we just changed the color of the 11/0 seed beads from sea green to light blue to navy and it makes a color blocked effect. A Russian spiral made with three colors gives a spiral and dot effect that looks much more complicated to make than it is. In this example, we just changed the color for one of the size 11 beads. For example, the pattern for each new stitch is a size 8 silver bead, then a size 11 matte white bead and a size 11 light blue bead. Making a bangle bracelet with Russian spiral stitch is straightforward. You just need to stitch the ends together when it is the proper length. Since the stitch has a good amount of give or stretch, it can roll on most size wrists. For this bracelet though, we stitched around a wire bangle. It was easy to do and gives me the option of adding some charms to the bangle, plus it does not pull at the thread when you are putting it on and off since the bracelet expansion is in the wire, not the beaded part. The adjustable bangle bracelet is from Nunn Design. Russian spiral is perfect to make rope style necklace chains for bead pendants. To finish Russian spiral, make several passes through the top rows and add a beaded loop to attach a clasp. Reinforce with multiple thread passes before weaving in the thread ends. Toggle clasps work well for both necklaces or bracelets. You can also sew the ends together to make a slip-on bangle bracelet or necklace.